STORRS, Conn. – There is no replacing Cierra Dillard. The University at Buffalo women’s basketball program is not only losing one of the top players in its history to graduation, but one of the top guards in the country. 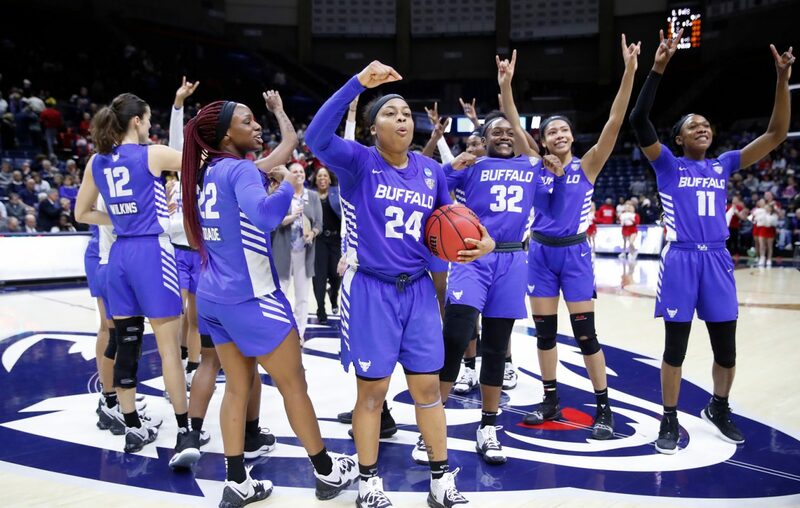 The Rochester native, who considered quitting basketball before transferring from Massachusetts, helped UB win the Mid-American Conference tournament championship this season, accomplishing the goal she set when she returned for her senior season. She helped UB not only reach the NCAA Tournament in each of her two seasons in a Bulls uniform, but win a game each time they were there, advancing to the Sweet 16 as a junior and to the second round this season, allowing UB to become the first program in MAC history to accomplish the feat. She valiantly returned from a painful ankle sprain to help No. 10-seeded UB claw to within single digits of No. 2 Connecticut in the fourth quarter of Sunday night’s 84-72 loss to the Huskies in the second round of the NCAA Tournament. And that’s just on the court. Dillard was introspective the day before her final college game, recognizing how much she had grown as a player and person in a relatively short period of time. It will surprise nobody when Dillard is playing in the WNBA next season. What becomes of the UB women’s basketball team is less certain. For the second year in a row, the Bulls will lose five seniors to graduation, including Dillard, Courtney Wilkins, Autumn Jones, Ayoleka Sodade and Brittany Morrison. Dillard is the only starter among the group. Starting junior forward Summer Hemphill and junior guard Theresa Onwuka have another year of eligibility, and it appears it's Hemphill’s responsibility to take the baton from Dillard and lead the Bulls moving forward. She grabbed a MAC Tournament-record 21 rebounds in the conference title game victory against Ohio and led UB with 27 points in its first-round NCAA Tournament victory against Rutgers. Starting sophomore point guard Hanna Hall and freshman forward Adebola Adeyeye lead a group of nine underclassmen – including a whopping seven freshmen – who will absorb this season’s experience and undoubtedly grow from it. The players who remain will be the ones to carry Dillard’s legacy into next season and pass it on to the next wave of recruits. And after three NCAA Tournament appearances in four seasons, and seeing what Dillard was able to accomplish in Buffalo, it seems reasonable to imagine talented high school seniors taking an extra hard look at continuing their playing careers with the Bulls. Dillard’s legacy is one of grit, determination and perseverance. “I can’t even put into words how much impact Cierra has had on not only me, but the Buffalo program since she’s been here,” Hemphill said after the loss to UConn. “She’s really like a big sister to each of us, and she’s one of the oldest on the team, so we all look up to her. And she comes to us with open arms on anything that we need, on the court and off the court. She’s so smart with her basketball IQ, and off the court, as well. And we’re really going to miss her. Hall said Dillard’s trust and support were critical components to maintaining her confidence this season, especially during a seven-game stretch late in the regular season when she lost the starting job, only to reclaim it in time for the team’s postseason run. Dillard’s name is scattered throughout the UB women’s basketball program’s record book. She’s listed in most single-season categories, sometimes more than once, and it’s often at or near the top. She has the most points, field goals attempted, 3-pointers made and attempted, free throws made and attempted and steals in Bulls history. She’s top five in minutes, field goals and assists. She’s in the top 10 in most of those categories under career records, as well, a testament to her on-court success, given she’s played at UB for only two seasons since transferring from UMass. Dillard amassed 2,205 career points between her four seasons at both schools. As a senior, she set the UB single-season scoring record with 856 points, blowing past the mark of 708 points set by Kourtney Brown in the 2010-11 season. Dillard set a single-game program record with 43 points in a blowout victory against Eastern Michigan on Jan. 9, topping the mark of 39 points set by Brittany Hedderson in 2011. She became the fastest player in program history to reach 1,000 career points, getting there in only 53 games. She has 1,422 points in a UB uniform, good for fifth place on the all-time scoring list. Dillard was second in the nation in scoring this season. She scored in double digits in all 34 games. She was named the MAC Tournament Most Valuable Player. Dillard’s 20 points, four rebounds, six assists and four steals were critical in UB’s 82-71 victory against Rutgers on Friday in the first round of the NCAA Tournament. Her 29 points, seven rebounds and seven assists against UConn – and her determination to get back on the court after injuring her ankle in the fourth quarter – left an indelible impression on everyone, teammates included, who witnessed the final moments of her college career. But the statistics and accolades are just a piece of her legacy. Her impact will last with the program, with her teammates and with her coach for years to come. What she leaves behind is much more intangible and valuable. “Her legacy is kind of like the same as mine,” UB coach Felisha Legette-Jack said. “We failed. We failed in our confidence, we failed in our jobs, she failed at UMass and I failed at my last job, as she got a chance to begin again, and she chose Buffalo to have that chance and she became, and she grew and she prospered. And that’s all we want from our young kids, is to know that it’s OK to fail. And sometimes you are going to fail publicly. And sometimes it’s going to hurt, and there’s going to be tears in front of people. And it’s OK. Stand in it. You stand in it, and she stood in it and she told her truth. Jason Wolf – Jason Wolf is a sports enterprise reporter for The Buffalo News. He is a 15-time recipient of the Associated Press Sports Editors national top-10 writing award. His work also has been honored by the Society for Features Journalism and cited in The Best American Sports Writing anthology.